Twas a frigid February evening in Astoria, Queens. Sam and Veren sat perched on stools in his cozy and unusually large kitchen. They talked travel over a dinner of homemade vegan mushroom risotto. Veren had always wanted to return to the Southwest, where he had spent a couple summers visiting New York friends whom had transplanted to the Land of Enchantment AKA New Mexico. Sam cut him off and asked him why he didn’t just go. Little did we know that that conversation would lead to our first roadtrip together. Santa Fe is a beautiful city. They maintain a legislated aesthetic of earth tone architecture in one of three styles: Pueblo Indian, Spanish colonial, and Territorial Revival. 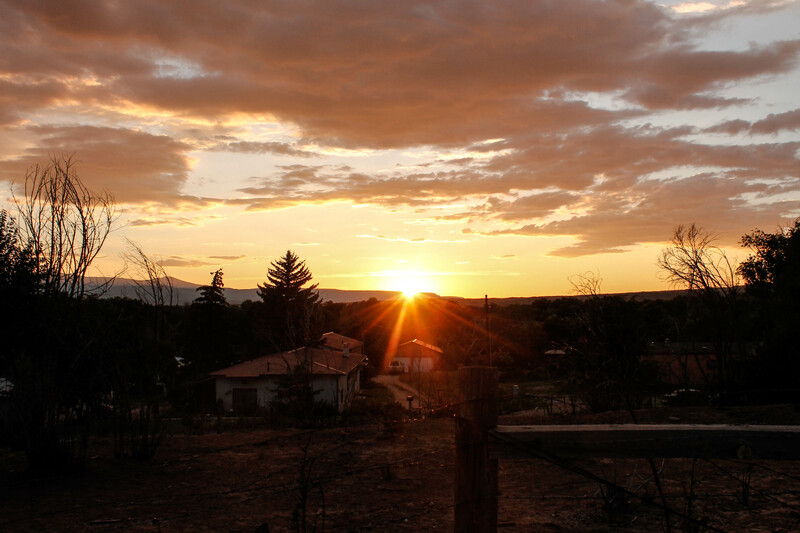 Northern New Mexico is characterized by beautiful sunsets over sprawling desert plateaus framed by forested mountains. The landscape of New Mexico is vast and open, even right around Santa Fe. The unusually wet summer created an abundance of green. After spending some time with friends in Santa Fe, we rented a car and headed north, equipped with a two-person tent, a pocket rocket stove, sleeping bags, and lots of refried beans and corn tortillas. Chimayo is the heroin user capital of the country, or world, apparently. Here the streets were especially dusty, and dogs would chase your car. We parked near El Santuario de Chimayo, and walked around the tiny town, which you could completely miss from the main road. The small shrine is an important Catholic pilgrimage site. Heading north, our friends recommended an overwhelming amount of options for possible stops along the way. Intending to head to Telluride, Colorado, we took a wrong turn, towards Taos. Once we discovered our error, we embraced it, ditched our list of places, and simply went. Shortly after our mistaken turn, we crossed a gorge of the Rio Grande, and came across a gathering of parked vehicular vendors selling their wares. A man even came out of the coffee bus and tried selling us Grateful Dead t-shirts. We also stumbled upon Earthship Biotecture’s world headquarters. Earthships are off grid, sustainable homes built from recycled materials that have modern amenities, including their own green houses. We want to build one someday. Before leaving, we had purchased the invaluable AllStays Camp and RV app, which maps out and lists campsites of all types and what features they have (like price and amenities). From this point on, we used the app as a guide, looking at it in the morning to see where we could camp in the evening. It was exhilarating and freeing, and led us through new and unknown landscapes of New Mexico and up into Colorado. 4 Weird Places Found Roadtripping the Western U.S.